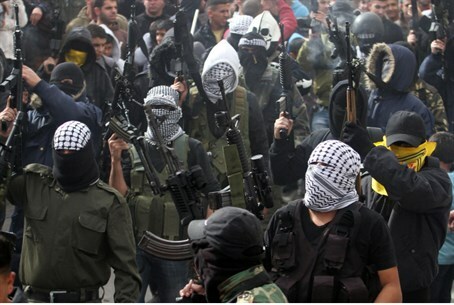 Terrorist organizations in Gaza, including Hamas and Fatah's Al-Aqsa Martyrs' Brigade faction, threatened on Tuesday that they would take action if Israel continues its crackdown on the Hamas terror infrastructure in Judea and Samaria. Commenting on the IDF operation seeking to rescue the three Israeli teens kidnapped by Hamas terrorists last Thursday, the terrorist groups declared that the IDF would "fail" to break the will power of the "Palestinian resistance." In a joint statement read at a press conference in Gaza, the terrorists said, "We support the sons of our nation in the West Bank given the terror attack," referring to the IDF counter-terror operations targeting Hamas. "The resistance will not stand helpless against the policy steps of the occupation; we are one nation, our suffering is one, our fate is one and our struggle is one," added the joint statement. Despite the words of unity, the Palestinian Authority (PA) and Hamas have had a sort of falling out over the kidnapping, with the PA celebrating it even while distancing itself from Hamas and threatening to break the unity pact over the Hamas abduction in unconfirmed reports. Hamas for its part has condemned the PA for allegedly cooperating with Israel in the search. The terror groups also stated their support for the hunger-striking jailed terrorists, praising their "heroism" against the "racist occupier that only understands the language of force." 80 jailed Arab terrorists have been hospitalized after refusing to eat for nearly two months; in response the Knesset has presented a controversial bill to force-feed them. Signed onto the statement were: Al-Qassam Brigades of Hamas, Al-Aqsa Martyrs' Brigades of PA Chairman Mahmoud Abbas's Fatah faction, Al-Nasser Salah Al-Din Brigades of the Popular Resistance Committees (PRC), Abu Ali Mustafa Brigades of the Popular Front for the Liberation of Palestine (PFLP), National Resistance Brigades of the Democratic Front for the Liberation of Palestine (DFLP), Al-Aqsa Defenders' Brigades and Saif al-Islam.